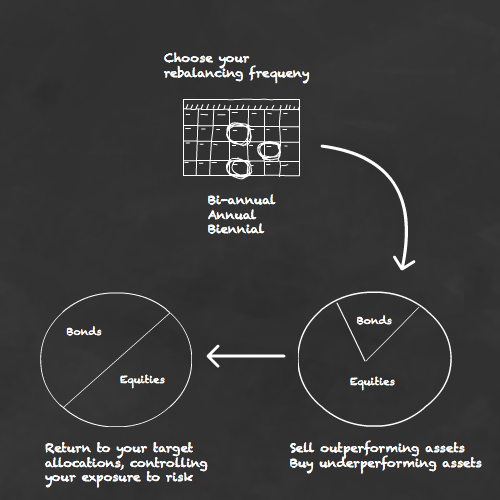 What’s the right way to rebalance a portfolio is a question often asked and about as simple to answer as what’s the right way to end a relationship – the results vary according to circumstance and personal style. A number of different portfolio rebalancing methods exist, but there’s no clear-cut evidence that there is one system to rule them all. There is no easy one-size-fits-all rebalancing solution. Rebalancing decisions should be driven by the need to maintain an allocation with a risk and return profile appropriate for each investor. 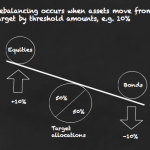 The optimal rebalancing strategy will differ for each investor, depending on their unique sensitivities to deviations from the target allocation, transaction frequency, and tax costs. When it comes to rebalancing, like so many things in life, it’s doing it that counts, not exactly how you do it. So, as passive investors like to keep things simple, you can go easy on yourself and plump for the most straightforward option: Calendar rebalancing. This apparent act of madness is banking on mean-reversion; you aim to cash in on the shooting stars before they fall back to Earth, while potentially turning today’s dogs into tomorrow’s winners. Beware! The more often you rebalance, the more likely you are to curtail the superior returns of the winners before they turn into losers – essentially because you cut the winning run short. The advantage of frequent rebalancing is that you’re less likely to be over-exposed to an asset on the rampage, and so avoid excess pain when the sell-off begins. Many finance professionals urge frequent rebalancing as a way of enhancing returns. But reliable evidence for this is scant, as it really depends on how you cut the stats to suit your argument. What is certain is that frequent rebalancing increases trading costs and potentially your tax liabilities. That can be more than enough to wipe out any chance of a rebalancing bonus. I prefer to rebalance no more than once a year. That gives winning assets a reasonable time to go on a run, but also means I check in often enough to correct any major deviations caused by frothy markets. 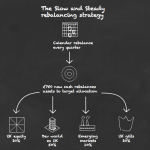 The weakness of infrequent calendar rebalancing is that it can leave you exposed to big changes in your portfolio – occurring over short periods of time – when markets are volatile. The answer to that is threshold rebalancing. Love your site and regularly check in. I’m just starting out on my investment lifetime. I’ve got everything organised (goals, asset classes etc.) an now need to pick what funds to use. Is there a generic set of criteria you can reccommend to select passive funds? I’ve used Tim Hale’s book up to now, but it’s a bit weak in the guidelines for actual fund selection. What are your thoughts are instead of selling the portion of your portfolio that has increased in value – you simply change future contributions? I haven’t seen much on that technique. @ Dave – not sure if you’re looking for actual funds or criteria to choose funds. Am planning a checklist of criteria to help choose funds, but it’s a big topic. @ Evan – Absolutely, if you can rebalance purely by adjusting contributions then do it that way. Saves transaction costs. Equally you can divert dividend income or interest earned to the same ends. Just to add to The Accumulator’s response, that’s exactly how I rebalance my portfolio in practice. It’s probably ideal for people investing regularly e.g. monthly. I don’t worry about about the exact % allocated to each to each asset class, I treat the % as a target that I’m working towards. I don’t have a complicated strategy with a dozen asset classes to manage; I want a simpler life; which is why I love Monevator’s/Accumulator’s KISS approach. I look forward to learning about “threshold rebalancing” though. It may have been useful at the end of 2010/start of 2011 when equities raced ahead (which I regarded as a “nice problem to have”!). Thanks a lot. I’ve been using your pages as a guide. I was thinking that criteria to select funds would be more useful as this will enable us to assess new funds as they emerge, and compare them with the ones already selected. Looking forwards to the checklist! Happy to send you what I have been working on, it it might help. @ Dave – would be only too pleased to see how you handle things. Would be interesting to get another perspective. Please mail to the usual Monevator address if you’re happy to share. @ Tony – Amen to all that. The threshold piece has quite a few pointers about working within ranges rather than slavishly rebalancing to an exact target, which as you point out is unnecessary. Your comments and Evan’s make me think that another rebalancing post working through a practical example would be a good idea. One that shows how new money feeds in and how you don’t have to worry about rebalancing to perfection. I have been wondering about rebalancing and also thoughts on “avoiding crashes”. I just moved my funds over to Charles Schwab. They happen to be who our broker/dealer uses so it made it easy. They also offered quite a few ETFs that don’t have a sales charge. Since I just started I try not to go look that often, but I worry about the stock market being overvalued. I still have quite a number of years left (I’m 41) so I also contemplate just riding it out. I know you can’t “time” the market, but do you believe there are enough signs to be worried? – I am 62, about 4 years from retirement, and would like about a 50/50 or 45/55 s/b split by then. – To get the full employer match, I am contributing 10% to the 401(k), where the best investment option is the Fidelity Spartan US Stock Index. – I moved a lot of my 401(k) tax-deferred last year to my traditional IRA with Vanguard, where I have the funds I want to choose from and am well-diversified between domestic/international stocks and bonds. – I last rebalanced to 55/45 s/b late last year, but already the stock market has pushed that to something like 59/41, which is more aggressive than I’d prefer. – I am thinking of rebalancing in a few months to 50/50, so that even if the market continues to soar, I won’t be seriously out of whack for my intended targets. Accumulator – Nice piece. Along those lines, do you know of any free or low-cost tools that allow you to backtest a portfolio and that also perform a yearly rebalance? I have looked, really looked, but can’t find one. Some of the expensive advisor related tools purport to do it; doing it by hand (looking up historical fund quotes and then manually rebalancing for 10 years) is cumbersome at best. @ Chris – You can’t avoid crashes. If you could, you’d be able to time the market, and as you say, you know you can’t. What you can do is have a stock/bond mix that means you don’t panic when things get rough. Could it be that you’re more exposed to stocks than you’re really comfortable with? @ Larry – If it’s already more aggressive than you like then why not rebalance now? Have you considered picking a threshold rebalancing scheme that would enable you to stay within boundaries that you’re comfortable with and then checking in every few months to make sure everything’s still on track? @ Robaire – no, unfortunately I don’t. Are you looking for some historical evidence as to what rebalancing system would have suited your portfolio best? If it’s really important you lay your hands on that info, you could always get a quote from an advisor to perform that one specific task. The 5% rule worked very well for me! In my opinion, use one method and stick to it religiously! Discipline wins! Stock returns exhibit mean reversion in very short-term (1m) and very long-term (3 to 5 years) basis. In the medium terms (6m to 1 year), they exhibit momentum. Judging by these characteristics, if transaction and tax costs are ignored, one should rebalance very frequently, or “no more than once a year” as Bill Bernstein said. If transaction and tax costs are taken into account, no more than once a year, but no less than once every three years is optimal in my opinion. @Chris – If worrying about stock market over-valuation keeps you up at night, how about using a (mild) automated valuation-based market-timing mechanism? Perhaps there are studies illustrating that such a rule tends to reduce volatility while not harming long-term returns (much). I tend to think, however, that the psychological benefits of following such a rule might be more valuable to an investor than a better risk-return profile: there is comfort and peace of mind to be derived from knowing that you do something sensible to hedge stock market over-valuation. I claim that the key here is the automated nature of the rule: if “tactical asset allocation” requires (too much of) an investor’s judgement then it is harder for her to sleep well. Last year I invested in a mixture of OEIC funds, including trackers which have achieved an 9.3% increase (£7000). I intend to leave well alone for the next 5 years at least. However, I am interested in thoughts about when , if at all, to take some profits. I read somewhere that some purely share investors sell some holdings to take half the profits. Apart from portfolio rebalancing, does this profit tactic rationale apply to OEICs ? What do you think about rebalancing in a downturn? All my index trackers are currently decreasing in value but at varying percentage rates…do I sell the trackers that are decreasing the least to buy more of those trackers decreasing the most to keep my overall asset allocation percentages similar to those I planned? First and foremost I want to say I love your website. Its great content and explanations got me started with passive investing few years ago. Now, I would like to ask you guys if I am doing something wrong with my investing and rebalancing strategy: since April 2014 I have been dropping every month £1k in a NISA account and distributing each time this amount in Vanguard funds to have each month a 60% share 40% fixed-income split. As of today, my returns are 0%. Am I doing something wrong with my rebalancing strategy? 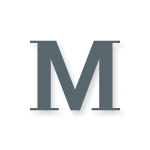 @ Matteo – it seems more likely that you’ve been hit by falling equity prices. As have we all. @The Accumulator thank you! if that is the case, it is fine. I wanted to make sure that the investing methodology was correct. Rebalancing with sales makes capital gains calculations much harder if outside SIPP/ISA. Its not too bad when you have a policy of only paying in, then only paying out, as you can work out the high watermark unit cost once and apply it to all sales. Much harder if units are going in and out all the time. In accumulation phase, you could use dividend rebalancing, use Inc units and reinvest the dividends of all in the weakest. Would have problems subduing high performers though. In deaccumulation phase, you spend the dividends and sell off slices of the top performer. Going forward I’m just going to rebalance with either new money going in, or the other option of re-directing dividends. H-L give you a choice of re-investing income from ETFs and investment trusts or just collecting the cash to stick into different assets. So you could rebalance/de-risk over time by taking equity fund dividends and using them to buy bonds, commercial property, whatever to get to your desired asset allocation. A timely refresher, thanks. I just add cash to my ISA each month and periodically buy just one LifeStrategy fund. I should automate it to avoid wrestling over when to buy and the relatively “high” price at the moment. It takes a re-read of the whole passive approach to build up the courage to avoid trying to time it. Id suggest that you dont have to sell anything to rebalance when your portfolio generates income, just assign the income to the respective asset and off you go. Saves capital gains. Though of course not distribution gains. That’s the problem I face in that I have to reinvest following a ISA transfer. I may need to take an income from this in a few years so was looking for income/distributing funds the income from which I could use to rebalance in the interim. Problem is that not all funds offer income flavours( look away iShares) and in any case a realistic yield won’t generate much in the way of a rebalancing balance. Asset Allocation is 30% Equity ,65% Bonds and 5% Cash-will be this to the finish probably. 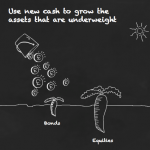 Keeping Cash Fund replenished(1 years expenses) by selling whatever is over limits-could be Bonds,could be Equities as required-sometimes a bit of both! I wonder what the evidence base is for rebalancing actually increasing investment returns? You mention it is “scant”, but I’m struggling to find anything of any quality at all..! I belong to the lunatic fringe of investors who never consciously balance different assets and therefore have nothing to rebalance. I am 72 and live mostly on dividends with very minor contributions from fixed interest assets and a tiny 5k civil service pension. I can’t think of my house as an investment as I will never sell. My investments have performed very well over a long period. For all practical purposes, I never sell any shares and am lucky enough to have just enough assets and sufficiently low expenditure not to worry too much about periodic market collapses, even quite big ones. Of course, Armageddon would affect everyone but we are a bit short of statistics on that one. We do know, however, that no investment, gold included, would be of any value at such a time. Unusually, I no longer have the drive to increase my assets by exploiting price variations. I can’t be bothered. The problem for most people, I would imagine, is that having finite and limited capital they can readily envisage situations where they might get caught out by being forced to sell when prices are low. Perhaps too readily envisaged sometimes. We have to be careful that we don’t scare ourselves unnecessarily in this way. Psychological disposition plays a major role here so the investment solution and degree varies from person to person. I am obviously near one extreme. My only purpose here is to present an alternative fringe view, the long established but underpublicized Nutter Method. “I wonder what the evidence base is for rebalancing actually increasing investment returns? There are so many variations to rebalancing procedures this is indeed a big ask. Howard Marks ‘The Most Important Thing’. To this the Constant Ratio Investor might add : ‘rebalancing discipline’? Thanks all for sharing your experience of rebalancing. Particularly glad to have been introduced to the Nutter Method 😉 Surely a movement we’ll be hearing more about in future years. @ The Accumulator – Thanks! Great article and great website, only beginning my investment journey, but have been returning here repeatedly for useful content. One comment / thought – the “Beware of frequent rebalancing” paragraph caught me a bit by surprise. Surely, much depends here on what we think rebalancing’s *main* purpose is – for some it will be profit maximising based on “mean reversion”, for others a risk management tool to “re-diversify” back into target allocation, cushioning potential downturn on asset classes that are more risky. In the latter case, frequent rebalancing (transaction costs allowing) is a *good* thing, isn’t it? I may of course be looking at it too much through the lens of my own situation – regular investor with a handful of funds and a broker (III) that offers low-charge monthly investment plan, where rebalancing happens every month at a very low cost – but I’m finding it hard to swallow the “don’t diversify often” point. Any thoughts? Hi AK, I think there’s a danger of becoming a little obsessive-compulsive about it. A bit like washing your hands after opening a door. Most of the time asset classes won’t drift particularly far from your allocation moorings in any given month. It’s not necessary to rebalance to a precise allocation that frequently. It doesn’t make much difference to your risk and it will cost you return if you’re selling off equities for bonds every time they rise a fraction. It’s not even a question of whether you believe there’s a rebalancing bonus on offer or not. Pruning back equities frequently is likely to cost you. Aside from that, it’s a faff and you’re incurring unnecessary trading charges. Take a look at the threshold rebalancing piece – gives you the best of both worlds.